Spotify sure has its merits as a musical database, either as your standard device for music consumption or, as for yours truly, a place to check out which records are worth purchasing. Most users are probably aware of the related artist function designed to help the listener find music related to the current listening experience. Even though this function has improved in recent years, back in the day it was absolutely horrid. A listen to Dismember could generate such wide suggestions as Darkthrone, In Flames and Dragonforce. One particular band kept, and keeps, showing up though no matter what I was listening to: Throneum. Despite this I never gave the band a proper chance, until now when the bands seventh full-length 'Morbid Death Tales' found its way to my mailbox. 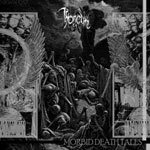 To say the influences on 'Morbid Death Tales' are diverse would be an understatement and the album has its own style, but generally speaking the music is influenced by bestial/war death/black metal in the vein of Blasphemy and Black Witchery with some late 80's primitive black metal thrown into it. The former type of music is generally quite monotonous, which frankly is part of its charm, making the drumming, primitive energy and attention-grabbing riffs key factors for enjoyment. The music on this album, however, is actually quite varied within this frame. The first couple of songs dwell in the mid-tempo region, then the albums moves to a faster pace only to end in a near doomy fashion. Also, the riffs have their distinct style which would have ended up on the plus side had they actually grabbed me thoroughly and pulled me down a black horrifying maelstrom. Now they fail to leave much of a lasting impression at all. The drumming would have been enjoyable had it not been held back by the peculiar production. The actual recordings of 'Morbid Death Tales' seem to have been done in a modern studio and are crisp and clean. The mixing job, however, seems to aim for a rough and dirty sound just by stacking the clean recordings on top of each other in a sloppy fashion. Like Darkthrone would have spent the same time as Metallica in the studio and still tried to get their distinct sound. The end result is not primitive and dirty, it is just confusing and unfavorable. Especially to the drumming which is nice and has an inherent intensity, but does not come to its own properly with this sound. The overall primitive energy beyond the drumming, which I sense is buried deep within somewhere, suffers a similar fate. Throneum deserves some recognition for their varied sound, having their own style and decent songwriting skills. The lack of memorable riffs and the confusing production job, however, are not in the album's favor. 'Morbid Death Tales' is not outright bad, but does not call for repeated listens either. It is just, well, average. On the plus side, though, it seems that Spotify's related artist function does have some merit to it.